New–Jersey-based Warren Bobrow, known as the Cocktail Whisperer in the hospitality industry, is a mixologist, bartender, contributing writer for Forbes and author of, among other books, Cannabis Cocktails, Mocktails & Tonics: The Art of Spirited Drinks and Buzz-Worthy Libations. On Dec. 19, Bobrow was on his first visit to Toronto to talk about what he’s most passionate about: infused cocktails and mocktails. “Drinking is part of our culture. What I have chosen to do with my book, Cannabis Cocktails… is make infused drinks approachable—by mixing together ingredients in a way that’s cohesive and not overwhelming,” says the 57-year-old author of six books. The hospitality session, organized by the Canadian Association of Professional Sommeliers (CAPS) Ontario and Lifford Cannabis Solutions, tastefully coincided with the holiday season and the regulations on cannabis edibles and concentrates to be announced by Health Canada. To help highlight cannabis’ place in the hospitality industry, Lifford in partnership with CAPS Ontario, has been hosting one such session monthly since legalization. 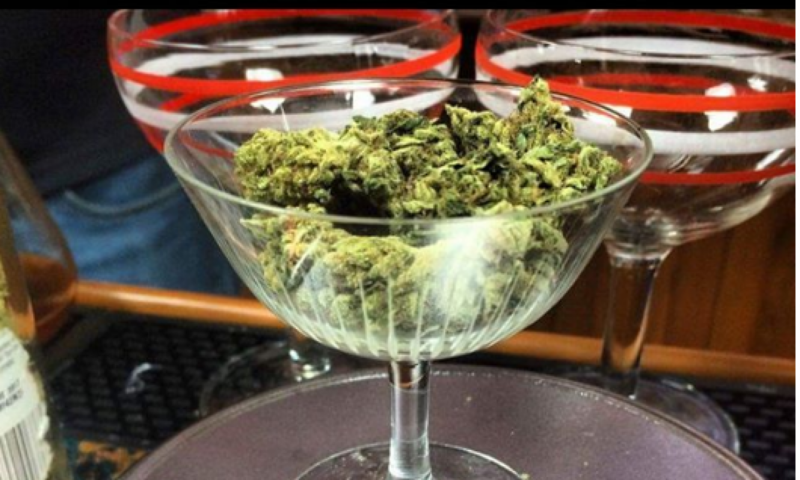 “Whether it’s restaurants or infused beverages, we are interested to see how the edibles regulations will change with the regulations set to be announced. At Lifford, we are a wine and spirits company, we are interested in the potential of creating infused beverages,” says Lisa Campbell, CEO of Lifford Cannabis Solutions. Apart from a talk by Bobrow, the session also had a cocktail and mocktail station. “Mocktails are the biggest trend of 2018. A lot of consumers are moving away from alcohol, and this session fits right into that dialogue,” says Campbell, explaining the demand for such a session. Guests, on the other hand, ranged from people who had never tried infused cocktails to others who couldn’t wait to give them a shot. “In the past, I haven’t been interested in infused anything, but listening to him and how he’s been retaining terpene interaction… because in infusion, you often lose the aroma, with the decarb product, I surely want to try it, now,” says Chris Klugman, CEO and president of Paint Box Catering. “There’s has been a huge interest in the overall wine and cannabis combination,” Klugman reports. More than fanning the interest and sharing trade secrets, the session also focused on education. “Love it or hate it, cannabis is part of our reality now,” says Kim Gertler, media and communications representative for CAPS Ontario. “That means, it’s part of the duty of care of every sommelier to look after their customer, and monitor their levels of intoxication and inebriation—whether it’s through alcohol or cannabis. It’s important for people to inform themselves. Education, knowing what works and not, is key,” Gertler adds.